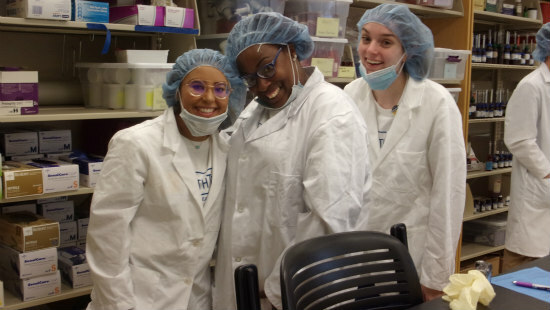 In the summer of 2015, 17 students from under-resourced high schools in the Kansas City area took their first steps on a journey toward futures career in healthcare. Now, in 2018, those students are taking another big step as they transition from high school to higher education. They are the first cadre of students to complete the KC HealthTracks program at the University Missouri-Kansas City School of Nursing and Health Studies. KC HealthTrack’s goal is to engage students in the health-care professions and prepare them for success in health-related careers. 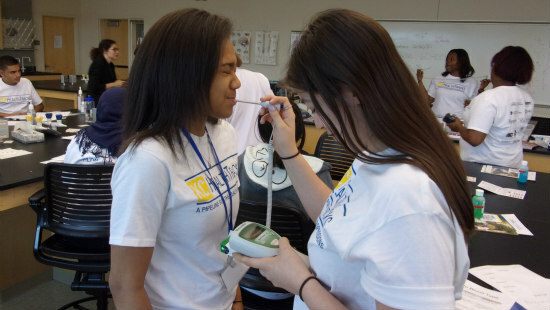 KC HealthTracks supports 127 high school students throughout the metro area. 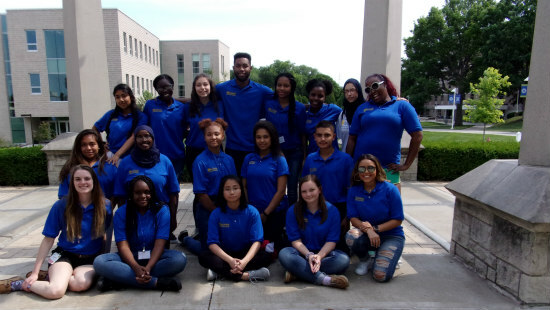 Participants attend a week-long summer program, where they have face-to-face faculty mentor sessions, visit health science programs at UMKC and Rockhurst University, receive math and science tutoring, and take part in ACT prep sessions. KC HealthTracks’ other community partners include Missouri Area Health Education Centers, Metropolitan Community College-Penn Valley, Kansas City Area Education Research Consortium, Urban League and the KC STEM Alliance, founded by the UMKC School of Computing and Engineering. 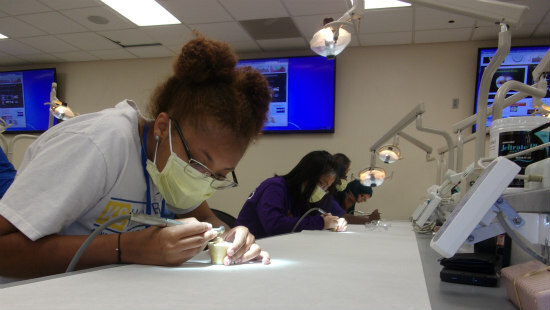 KC HealthTracks offers students career exposure to each of the health sciences disciplines offered at UMKC: dentistry, health studies, medicine, nursing and pharmacy. Enrollment for the next summer’s camp begins in spring 2019. Based on its initial success, KC HealthTracks has received an additional $551,000 in August 2018, with the initial grant of $2.5 million awarded by the U.S. Department of Health and Human Services Office of Minority Health National Workforce Diversity Pipeline for five years. The new funding will enable the KC HealthTracks program to expand its reach by adding another high school and students, bringing KC HealthTracks to 12 under-resourced high schools in the Kansas City area. New this year, the program is offering financial support for participants to take part in the KC HealthTracks summer camp. The School of Nursing and Health Studies secured additional funds to provide stipends to students attending all five days of the camp. In addition, stipends will be available to teachers who attend the camp with their students. According to Ann Cary, project director of KC HealthTracks and dean of the UMKC School of Nursing and Health Studies, the engagement of the students’ teachers magnifies the importance of the camp, strengthens the bond between teacher and student through shared experience and gives teachers ideas to incorporate in their curriculum. During the school year, the program will continue to engage participants through the mentorship of faculty advisors from School of Nursing and Health Studies among its activities. Currently, five faculty advisors will go to the students’ schools to provide one-on-one mentoring, advising and college preparation. Having faculty work directly with students to prepare them for higher education is a real-world example of UMKC’s commitment to urban community engagement. Students are able to share their personal experiences to give faculty advisors a better understanding of the challenges and opportunities for their mentees. The importance of that guidance by faculty members is on full display among the original group of KC HealthTracks students, who will enter college this fall. Of the participants who responded to a survey, 80 percent said they plan to pursue health-related careers. Among them is Nargiz Agayeva, first-year medical student at UMKC. Agayeva’s family emigrated from Azerbaijan, where her father was a physician. In the U.S., he wasn’t accepted for any residencies and was unable to continue his work in medicine. But her father’s drive to become a doctor, as well his great interest in science, drew Agayeva to the medical field. And having participated in KC HealthTracks, she’s grateful for the connections to this tight-knit, like-minded community. Through the program, she says, she gained her confidence to pursue her medical school dream.